The K-17 'Bumerang' infantry fighting vehicle is seen here during a show of modern and prospective weaponry at the Army 2017 International Military-Technical Forum, Moscow Region. Murakhovsky added that the new armored vehicle would likely be equipped with a 125mm smoothbore gun – the same as that used on the Sprut-SDM self-propelled tank destroyer. This, in Murakhovsky's view, would give Russia a "wheeled tank which has no equivalent in the world." Wheeled tanks, such as the M1128 MGS Strykers, French AMX-10RC, Japanese MCVs and Italian Centauros, are currently in service in a number of NATO countries, and also in Asia. In early 2010, the Russian Defense Ministry was in talks with Italy to buy a number of Centauro wheeled tanks. Several such units were brought to Russia for testing, but the Centauros proved less reliable than expected. A wheeled tank is just one of a whole family of armored vehicles based on the Bumerang platform. The Bumerang APC was unveiled to the public during the 2015 Victory Day parade in Moscow. 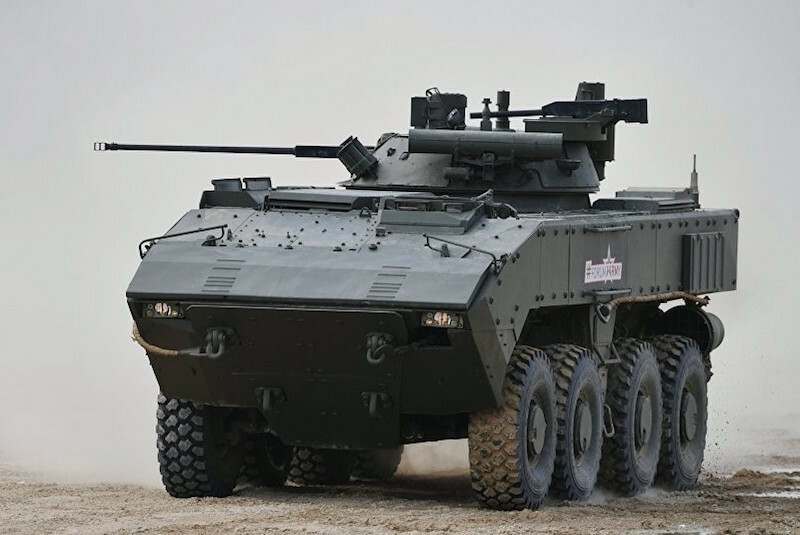 Plans are also apace to build an armored fighting vehicle, a reconnaissance vehicle and a number of other modifications based on the Bumerang armored platform. According to the developers, the armored vehicles will have highway endurance of around 800 kilometers (500 miles) and a maximum speed of about 100 kilometers per hour (62 miles per hour). The new vehicles will also be better protected than their wheeled predecessors with the Bumerangs featuring variable-armor thickness depending on a concrete mission. The developers say that in the heaviest armor configuration, the Bumerang will be able to withstand a direct artillery hit.